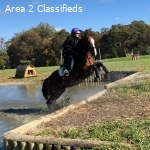 Ads - Horses for Sale or Lease - Promising horse for any discipline! Promising horse for any discipline! Tango is a great show prospect for any jumping discipline! He has mileage in the both the hunter and jumper ring up to 2'9" (.85m) and has evented at the Beginner Novice level. He is currently working on basic lateral movements on the flat and schooling 3' courses with some larger single jumps mixed in. He has schooled banks, ditches, and water and Novice XC jumps with ease. Tango also enjoys hacking out on his own or in company. He has not foxhunted, but is comfortable around dogs or in close quarters. Tango can get a little nervous under saddle as he is eager to please. He needs a calm, patient rider, but is very easy to handle on the ground and has an in-your-pocket personality. He loads and ships well and stands quietly for the vet, farrier, and dentist. Easy to groom/clip/pull his mane. Tango is a cribber that is controlled with a collar. He has no known soundness issues or history of illness. Contact for more photos or video. Price to increase with training.